The Bird of Paradise (Strelitzia) plant is a showy, easy-to-grow topical plant that does best when placed in areas with bright, indirect light and consistently warm temperatures. It is often confused with the Banana plant, as both have massive leaves that grow upward from the centre. This plant is native to South Africa, but is now seen in many tropical areas of the world. It is a great houseplant and is frequently used outdoors in southern Ontario through the summer months in containers or planter beds. Place the plants in areas sheltered from the wind though, as the leaves will shred easily. 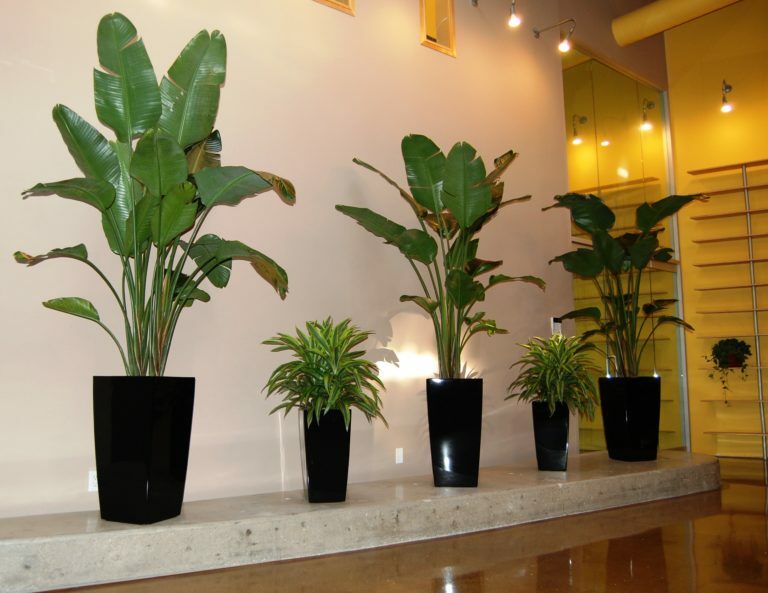 There are two species of this plant that are used as house or tropical office plants: Strelitzia nicolai and Strelitzia reginae. S. nicolai is the most common. It has larger, more rounded and shinier leaves. This plant can produce flowers that are predominantly white. S. reginae flowers are orange and blue, or occasionally yellow and blue. 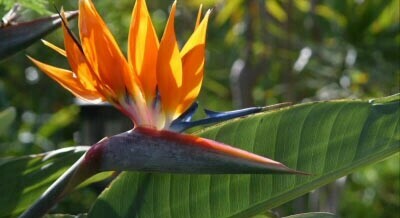 It is rare to see the characteristic flower on a Bird of Paradise grown in homes or offices. The conditions need to be ideal, and it takes 3-5 years for the plant to mature enough to produce a flower. On occasion, we have been excited to see flowers on some of the older plants that we maintain in established atrium settings. The care of this plant is relatively straightforward. Keep the soil evenly moist, but not wet. A humid location will deter the leaves from splitting as they open, although this is normal to some degree and adds to the character of the plant. Watch for spider mites on the leaves. Regular cleaning of the leaves will help prevent pests. Mealy bug (white cotton-like spots on the undersides of the leaves and on the petioles) will often develop if the watering is inconsistent. As with all plants, fertilize monthly from late winter to late fall. This plant does grow quite quickly, but repotting is rarely necessary. The size can be managed by removing new growth occasionally.